Mifflin County High School’s Kyler Snook, left, runs the ball past Waynesboro’s Dalton Mowen Friday night at Mitchell Field in Lewistown. The Huskies fell to the Indians, 21-14. LEWISTOWN — For the third week in a row the Mifflin County football team played with confidence, tenacity and heart. 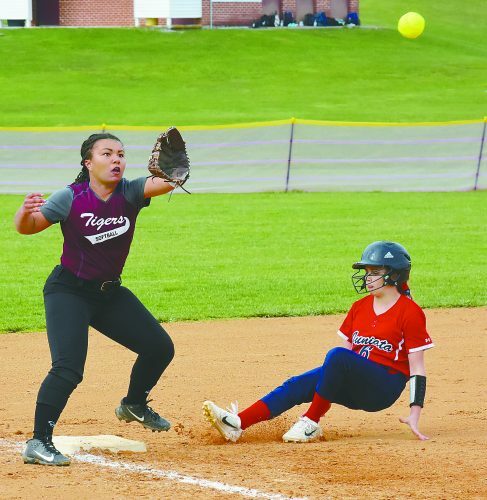 Unlike the past two weeks, the effort wasn’t enough to defeat Waynesboro. The Indians scored the tying touchdown just before halftime and reached the end zone on the first drive of the second half to come away with the 21-14 Mid-Penn Colonial victory Friday night at Mitchell Field, spoiling Senior Night for the Huskies. Waynesboro improved to 7-2 overall and 6-0 in league play to capture the Colonial Division championship and a berth in the District 3, Class 5A playoffs. Mifflin County ends the season 2-8 winning both of those games within the last three weeks with interim coach Scot Sechler at the helm. The Huskies hit paydirt on their first drive — going 61 yards in six plays that took only 1:58 off the clock. Cole Baker took it in from five-yards out and Davis Wagner’s PAT made it 7-0. The key play of the drive was a 27-yard run by freshman running back Gage Schaeffer. Waynesboro countered with a 13-play, 65-yard drive capped by a one-yard run from quarterback Ian Kershner to even things up at 7-7 with 4:47 left in the first quarter. 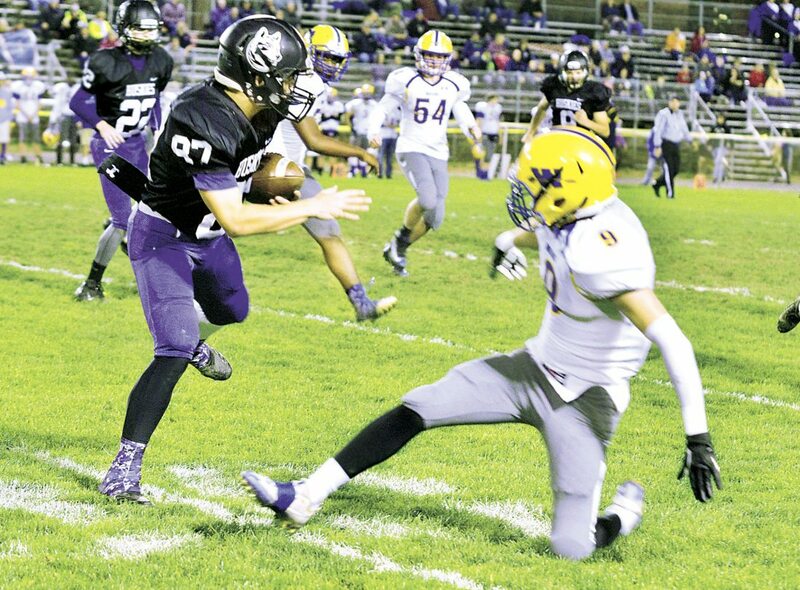 Mifflin County regained the lead at 14-7 when Schaeffer crossed the goal line with an 11-yard scamper. Schaeffer collected 49 of the 65 yards on the drive. The Indians responded once again scoring a touchdown with 27 seconds left in the half. Mason Frampton, who finished with 151 yards rushing on 19 carries, took it in from the one to make it 14-14 at the half. Waynesboro received the ball first in the second half and took advantage — marching on a 10-play, 80-yard drive that took up over five minutes of clock before fullback Tom Drumsta scored on a four-yard run. The Indian defense made their halftime adjustments and loaded up the box to stop the Husky ground attack. The move paid off as Waynesboro held Mifflin County to just 41 yards in the second half. Schaeffer, who had 90 yards in the first half, was held to eight in the second. Late in the fourth quarter, Mifflin County lost a golden opportunity on a controversial call. Shane Herberston appeared to be interfered with trying to field the Indian punt. The officials called it a fumble, giving the ball back to Waynesboro, who ran out the clock. “That kid put his helmet right under his chin. I thought it was a bad call and I voiced my opinion. I tried to put that out there without catching a 15-yard penalty,” Sechler said. As the Huskies gathered together in the post-game huddle, many hugs and tears were shed. A season that looked lost ended on a high note the last few weeks, giving the underclassmen something to build upon for next season. RUSHING: Waynesboro– Frampton, 19-151, TD; Drumsta, 17-72, TD; Kershner, 11-24, TD; Hoffman, 6-6; Gaskill, 1-(-1). Mifflin County– Todaro, 7-28; Schaeffer, 10-98, TD; Baker, 5-11, TD. PASSING: Waynesboro– Kershner, 5-8-0, 35 yds. Mifflin County– Krepps, 7-13-0, 69 yds. RECEIVING: Waynesboro–Hoffman, 2-20; Frampton, 2-14, Drumsta, 1-1. 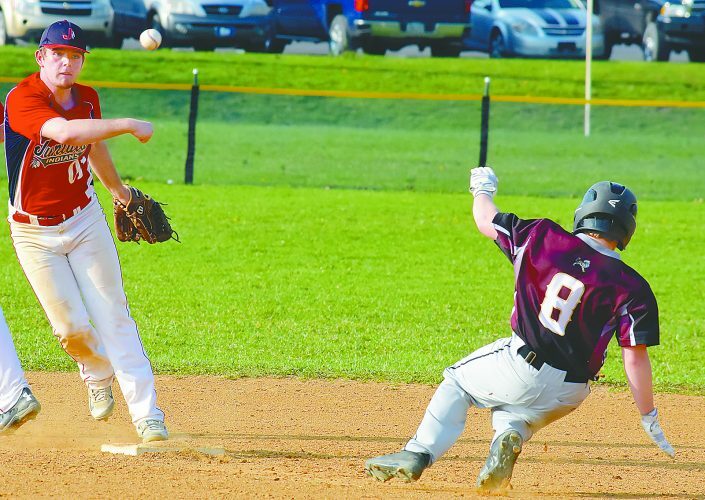 Mifflin County– Todaro, 3-27; Baker, 2-11; Miller, 1-27; Wright, 1-4. INTERCEPTIONS: Waynesboro– Johnson. 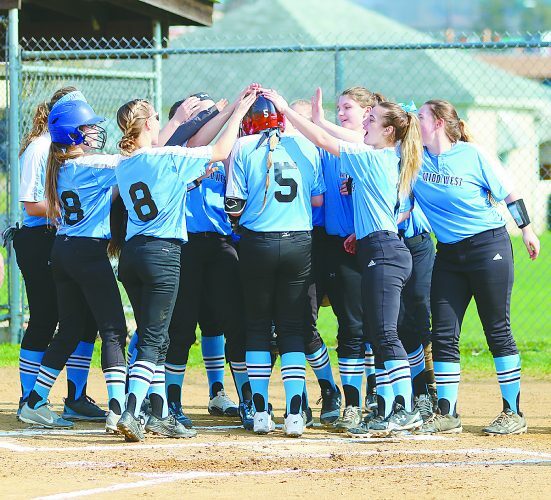 Mifflin County– none.